unplugged gigs for delivering the rhythmic foundation for a whole band when a full drum set cant be used. 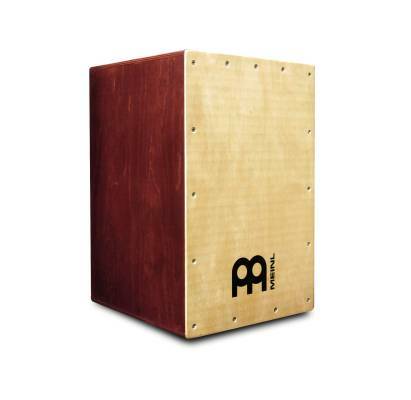 Out of the various Cajons I tried at my local L&M store, this Meinl Headliner Cajon was among the most responsive. Some of the more expensive ones had nice bass tones, but the highs were weak. There wasn't much tone to the wood. Perhaps, their faceplates were too thick and/or made from too heavy of a composite material. On the other hand, the Birch faceplate of this Meinl model resonates well, as well as the sides and back of the box. (Remember a cajon should sound good no matter which side you play. When you hit the sides or back there should be a nice tone to it.) The Granite Percussion which is priced similarity to this model has a poor snare design in my opinion. The snare wires are pressed against the Faceplate too hard, deadening the bass notes. So for the sale price of $125, this Meinl Headliner model is winner. However, the box doesn't come with a bag (that's why I only gave the features rating 3.5 out 5). And it scratches fairly easily. Unfortunately, I scratched up the back of mine right after I bought it by putting it in the car seat without being aware that seat buckle was rubbing against the back of it for the trip--bummer. So either wrap the box in blanket when you travel with it, or get a soft case for it. Good bass tones, good separation between snare and bass, would recommend to anyone. Got one of these gems for Christmas from my family. Added an LP cajon pedal to it and... acoustic rig! Worked it hard for four hours at an acoustic jam - NO WORRIES! The snare wires are a great but the tones are not the best. Over all i recommend this cajon for beginners! this is a great cajon and it looks great i recommend this cajon to any one!